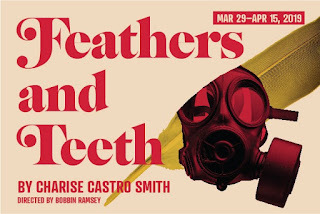 Feathers and Teeth by Charise Castro Smith, Directed by Bobbin Ramsey Washington ensemble Theatre, 12 Ave Arts, through April 15. I review a lot of plays in this space, but the overwhelming majority are with the Seattle Rep because, you know, season tickets. So it is a fairly comfortable process. But the chance sometimes offers itself to get out of one's comfort zone and find a new venue and a new attitude to towards theatre. In the case of Feathers and Teeth, a colleague's working group had the chance to provide animations for this show, and I promised I would show up. Glad I did. But more about that later. 12 Ave Arts is a nice, modern, small (about 100 seats) space up on Capitol Hill overlooking downtown Seattle. And if the major theaters playing musicals reaching up the avenues to the Seattle Space Needle area are the Broadway of Seattle, this area of the city is off-Broadway. Literally. No, really. Broadway is the main spine along the top of Cap Hill and this theater (and others) are a couple blocks east. 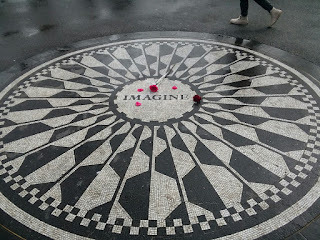 The 12 was opposite the space where long ago, we watched Mike Daisey speak of famous men, but I haven't been back to it in years. Anyway, the play. Christine (Rachel Guyer-Mafune) is 13 years old and is convinced that her future step-mom is a demon. Carol (Samie Spring Detzer) in the potential step-mom/demon in question, a nurse who came into the house to help Christine's terminally ill mom and now, after mom's death, is intent on staying on. Arthur (Brandon J. Simmons) is the hapless/helpless/hopeless father figure who is the third leg of this familial triangle. Hugo (James Shilling) is the German kid from next door. That's not completely accurate, but that's close enough for discussion. Because one of the things about Feathers and Teeth is that it keeps you off-balance throughout. Christine may be persecuted but she may be psychotic. Carol may be a candy-coated demon or she might just be merely mortal and manipulative. Arthur is an 80s sitcom dumb dad, a conciliator, and/or something much worse. Hugo is pretty much Hugo. But the off-balance nature is in part how quickly the characters pivot from one emotional state to the another. Carol goes from sugar sweet to vamping to vampiring easily, while Christine rolls from 13-years old to would-be Buffy the vampire slayer. It is sort like iCarly crossed with grand-guignol theatre. Arthur shows up early with blood on his hands early on. He ran over ... something ... in the driveway, something with feathers and teeth (no, not an archaeopterix - something older). The ... thing .. confined to a pot roast pot, is a monster. Or its a creature of vengeance sent by the dead mother. Or it is something else worse. And that contributes to the feeling that all is definitely off-kilter in this midwest suburbia. And that disturbed feeling powers through the play with a collection of family arguments, jump scares, and dark humor. The set design, crafted for this small space, also hits up the off-balance nature. The center is a suburban kitchen, but the walls break up into jagged space halfway up, and the proscenium surrounding the space is broad, uneven, and angular. It succeeds in a way that the bare, tilted stage from Doll's House Part Two fails. And then there's the animation, which is why I was there. A colleague runs Broom Cupboard Studios, which does animations, TV show pitches, and projects like Detective Corgi. His team was brought on to provide animated sequences within the show. The back window of the set usually shows a backyard, with light changes to show time progression, but is also used effectively to illustrate monologues/flashbacks during the play, giving them a richer context. Plus, very useful in the sections involving demons (along with that wide, out-of-kilter proscenium). The animation really nails down the story with a high class professionalism which equals to/outweighs some of the monkeyshines at the Seattle Rep (and Repsters should take notes on the seamless integration). Ultimately, the animation, sets, acting, and writing all builds to a horrific conclusion, a combination of interior and exterior horrors. I've been trying to figure out how to convey horror on the stage without tipping one's hand to hokey overkill, but Feathers and Teeth manages to do exactly that. It has been playing to full houses up at the 12 Ave, and will do so for another week. Good, creepy stuff. A Doll's House, Part 2 by Lucas Hnath, directed by Braden Abraham. Flash Fact: I've never read the Harry Potter books. Nope, that's true. My exposure to that universe consists of the movies and what I pick up on street corners. The Lovely Bride HAS read all of them, so our movie-going experience often consists of later debriefs where she explains all the back story of characters that seem important but we only see them briefly in the film. I am good with that. Similarly, Henrik Ibsen. I know, I am a barbarian to have avoided both Ibsen and Rowling, but such is my lot in life. But the Lovely B went through an Ibsen phase in her youth, and understood a lot of what Henrik Ibsen meant for both theater and Western Civilization in general. So I turned to her as a guide, and she gave me the skinny on A Doll's House, The Original Edition. Previously, on A Doll's House: Nora is married to Torvald and has perfect marriage, except it isn't. Rather it is filled with the smell self-denials and misrepresentations that a lot of marriages have. When Torvald is ill and can only be cured by sending him away on a trip that Torvald refuses to pay for, Nora forges his name on documents to borrow the money in order to save him. He recovers, he finds out, and is angry at Nora for the deception (you know, for Saving His Life). The situation is resolved, but Nora says to hell with the relationship, give me a divorce, I'm out of here. And she leaves, closing the door on her previous life, her husband, and her children. And this was radical back in the day (we're talking 1879 or so). The audience expected the problem set forth in the play to be resolved and with it a return to normalcy. And they also didn't expect to see the subordinate position of women in the relationship laid so bare. And this is why Ibsen is remembered. Yet, you have the challenge of "What happened next?" We had a resolution but, what happened next? What happened to Torvald? And Nora? And the kids? Inquiring minds what to know. Maybe there's a happy ending? But if you wait long enough, no story ever has a happy ending. The play pamphlet states you don't need to know about the first play (though it does repeat the final page of the original), and that is true. There is a lot of hashing and rehashing going on, and what people thought, or thought they thought, back then. Time does not heal wounds, and now as a result Nora is another situation of fraudulent documents (Scandinavians, regardless of the era, seem to have a great belief in contracts). And the deck is still stacked against women in general and Nora in particular. And there is a lot of lecturing. Indeed, the actors are confined to two roles - lecturing and being lectured to. From all sides. The four actors involved are all excellent at their craft, but there is precious little to work with, here. Stoic is a very Scandinavian trait, and the actors might as well be furniture when they aren't delivering their lines. There is no sense of dread or creeping doom that (I have heard) populates Ibsennic theatre present in Part Two. There is a problem, there are attempts to resolve it. Actually, while the play gives me nothing, the set design this time tries to embrace an idea of discomfort - a stark, uneven corner of a grand house, presented at an angle, filled with absent furnishings and only a few chairs. The walls are a yellowish tinge that can usually be found in new housing developments in Seattle, which makes you uneasy. It feels like they belong to a different play entirely. Ultimately, the question for me is if ADHp2 could exist on its own, without its noted ancestor hanging over the proceedings. Even though it does its best to fill in the bits from the earlier edition, it feels a bit empty. The characters don't seem to move, and we spend a great deal of time catching up on the last 15 years. If you are going to claim descent, then you ask for comparison, and I don't see the 2nd edition creating the stir, political and personal, that the first one did. We really didn't need to know how it all turned out. 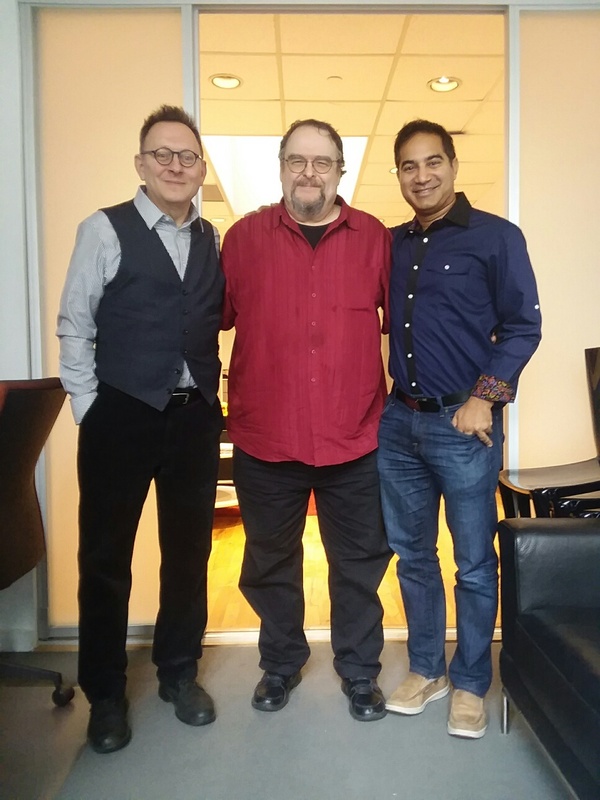 Messrs. Emerson, Grubb, and Khan. It was 2007 when I was last in New York (and that was for potentially turning Guild Wars into an animated TV series - nothing came of it). Back in the days of TSR, I was in town, regularly, in February, for Toy Fair. Toy Fair is still a thing, but I'm not there this time. This timeI was in town for a recording session for a game we're working on. I was recording lines with the brilliant Michael Emerson (of "Lost" and "Person of Interest") and the extremely talented Kamal Khan. I can't and won't give details, but both actors were fantastic. But I've noticed some differences of the town from almost ten years ago. There are more children and families in Manhattan than I noticed previously, and less sirens in the night. People honk less (I didn't say they stopped - I said they honked LESS). The lullaby of Broadway of continual gridlock is still there, but with less aggression. One thing I had forgotten about was salad with breakfast. The complimentary breakfast provided from the hotel was completely insufficient (three muffins), so I ended up ordering an omelette each morning, and it came with a salad. That worked out well for me. It snowed when I was out there. I mean, New York in February, so of course it snowed. A couple inches, enough to paralyze Seattle. Here it was a nice dusting. Families were sledding and building snowmen in Central Park. We were quartered right off of Times Square. New York hotel rooms are just as .... cozy ... as I remember. 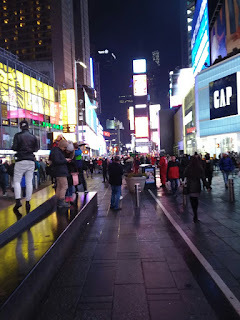 Times Square itself is America's Ginza district, and is amazing with its lights. In snow it is even brighter as each flake catches the light and reflects back. And yes, there were people everywhere, watching the snow. We had some down time, and took the opportunity to sight-see a little. Caught an exhibit on Stonewall at the New York Public Library by accident (we were checking out the architecture) on the way to the Tolkien exhibit at the Morgan Library. The latter was a beautiful small jewel box of an exhibit, crammed with all manner of Tolkien's artwork, both the famous (some of it graced various editions of the books) and the mundane (designs on crossword puzzles, creatures created for his children). Highly recommended. I have a niece (who works for the NY Public Library System) who lives in Brooklyn with her husband (who is working with a startup), and so I journeyed one evening by subway down to her neck of the woods. The slotst hat used to take tokens are gone, now. Brooklyn was pretty nice, and reminded me of the North Halstead neighborhood of Chicago - lot of brick, neighborhood corner stores, quiet streets, a variety of apartments and homes. We went to a place that offered Thai Street Food, with dished like pad cha, weeping tiger, and something with five syllables that sounded vaguely Klingon. Excellent food. My niece had warned me that the subways changed schedules on the weekends. 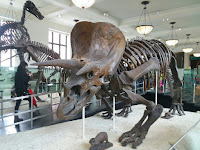 Despite this, I and a companion got on a train heading for the American Museum of Natural History (about 81st street) but ended up under 125th street (walking distance to the Apollo in Harlem). A very helpful old man (from Brooklyn - he lived on the street that used as an establishing shot in "Welcome Back Kotter") told us what we did wrong and helpfully directed us to another platform, which didn't have ANY trains running on it (because, weekend). Finally found a transit authority figure in an orange vest who was helping out confused travelers. Oh, yeah, did I mention that I have "talk to me" written on my forehead? Because that's what keeps happening. In New York City. On the subway. No, you don't need to talk to me! You have phones! Oh, all right, fine, tell me about your nephew in Queens. 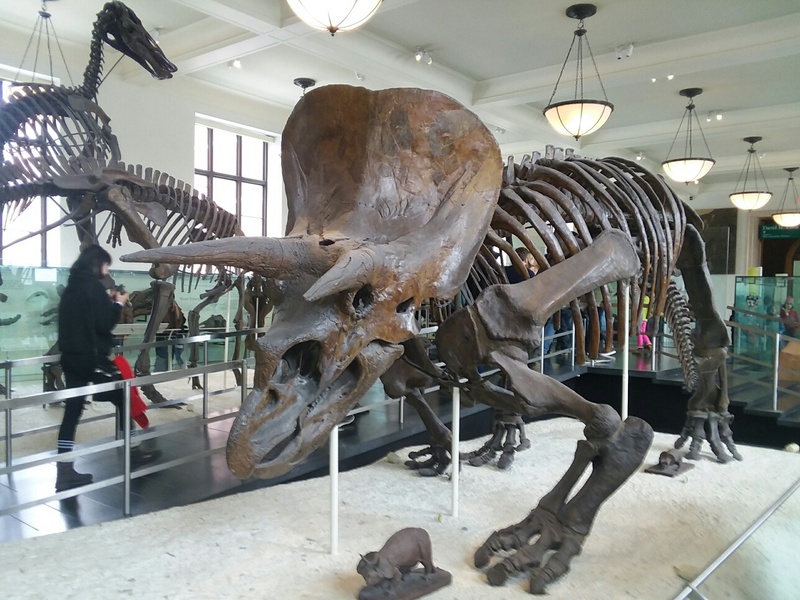 First time at the American Museum of Natural History. 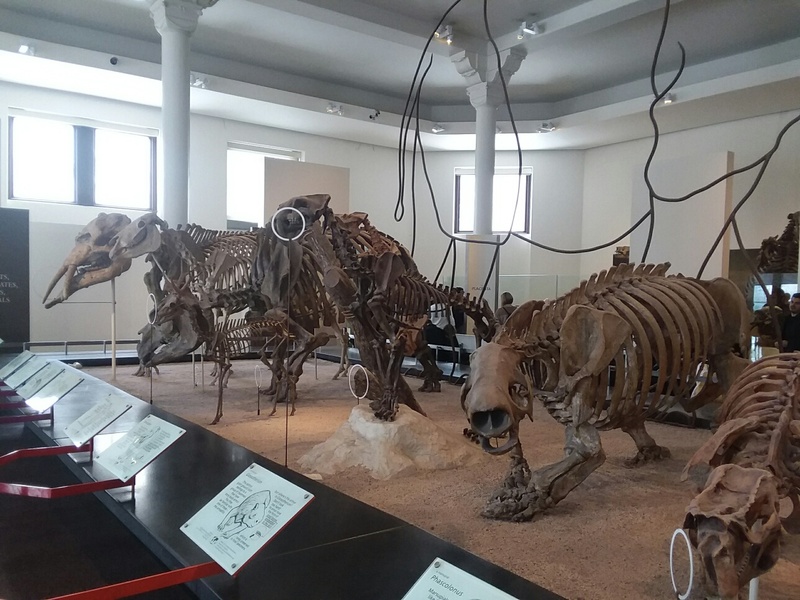 I grew up with the Carnegie Museum in Pittsburgh and loved the Field Museum in Chicago, and yet was very, very impressed. Their wildlife dioramas were amazing. The whale hanging over their Hall of Marine Life was great. I would give them the edge on the natural exhibits, but think the Field did better on exhibits on ethnography (other peoples). Parts were under renovation, it being February, including the Hall of the Pacific Northwest. Curious what they will do with it. Their top floor - the Halls of Vertebrate Evolution - where they keep the dinosaurs, are just amazing. I don't think I have been in a museum with as much textural density in years. Their presentation take no prisoners - you have to keep up with the Latin names and clades and synaptic openings and maniraptors. I could have spent a full day on that floor alone. I officially feel behind the times when confronted with both the traditional presentation of equine evolution and how more recent fossils blow a hole in that traditional view of evolution. I went in search of a mural from my childhood, in some LIFE book on evolution. Could not find out, and now realize that it was in the Peabody Library at Yale. Ah. There were good murals of the mammals, though. Did not get to Ground Zero this time. 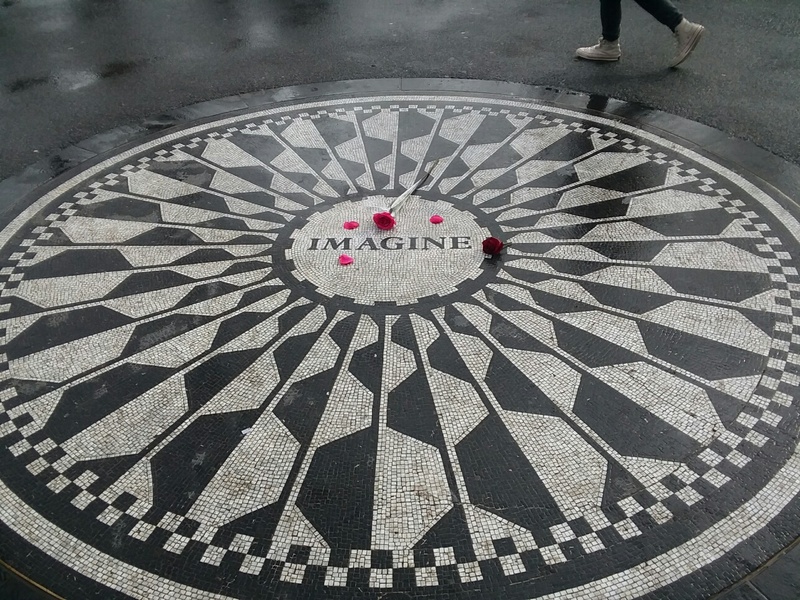 It was hard enough to visit Strawberry Fields, which commemorates John Lennon. There was a young Asian woman playing Beatles tunes on a folk guitar and an artist selling "bad portraits" Yes, they were bad. Just being there was a bit of a hit to the stomach. I had to sit down on a snowy bench and pull myself together. Walking through Central Park was wonderful however, and I rewarded myself with a Nathan's Hotdog from a stand. The New York food carts, by the way, have a lot more neon signs these days. And there are flatscreens on the subway. It is a very advanced world. All that said, 432 Park Avenue, one of the tallest buildings in New York, is as ugly as sin. It is the box should hold a mammoth toothbrush. No picture, because it is so ugly. I got down to the Strand Bookstore, which was heavenly. If you like Powell's City of Books in Portland, you'll be at home in the Strand. Lots of books, used and new, lots of people sprawled everywhere. Looked for some Nero Wolfe (I read Rex Stout's mysteries on the plane) but left with a volume of Johannes Cabal (The Fear Institute) by Johnathan L. Howards. Pro tip - there are cash registers elsewhere in the shop - you don't have to get in the big line by the entrance. Failed to hunt down the neighborhood of Nero's Wolfe's brownstone either, though I understand that the block was completely rebuilt when the Lincoln Tunnel was pushed through. Still, there is a plaque somewhere for that. The final evening I was on my own, and realized that my hotel was next door to the famous/infamous Algonquin Hotel, home of of the famous/infamous Algonquin Round Table. This was a daily lunch group of authors, editors, and other celebs that engaged in witty wordplay, logrolling, and mocking those who were not at the table. 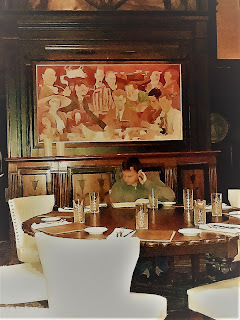 The restaurant has been renovated and the table itself is gone, but a portrait of the group does loom over a replacement table. Took one of my producers out to New York Pizza. It is more than just a thin crust pizza - it is very good, and I am a fan of Chicago Pizza, so that's saying a lot. I've said this before - New York City is a town that every American knows even if they have never been there. MAD Magazine, the New Yorker, Marvel comics, innumerable movies and TV shows. You know that location, and that building, and it all has a sense of familiarity about it. It is America's back-lot, and it is good to connect back to it again. The Woman In Black, adapted by Stephen Mallatratt, from the novel by Susan Hill, Directed by Robin Herford, Seattle Rep through 24 March. Pity that I did not see this a few weeks back, when we were supposed to see it, but due to other obligations had to move the tickets to this past Sunday. And it is a pity because I would recommend it, but it has but a week to play out. And the play worked for me in part because the Lovely Bride and I went into it stone cold. There were no ads on classical public radio that I caught, no reviews that may have occurred in the press, no summaries that I had a chance to read in advance. And we were caught in traffic on the way up to the theater, so breezed in at the very last moment before the curtain rose, so there was no chance to find out quite WHAT was going on. Indeed, once I tell you, even in the briefest form, your mind will immediately start to work on how it functions as a genre and as a theater piece, with the certainty of watching a movie's trailer and guessing spoilers. You see, it is ghost story. Ahah! I can see immediately that you know what I'm talking about. If there is a ghost story, there is a ghost, so we are already prepared for a haunting, and, armed with that familiarity. like seeing that trailer for a movie, you are already armed with assumptions and expectations. Armored against what is about to happen. Protected. So, if you have any interest in the play (and you should - it has been running forever on London's East End), you should put aside this review until a later date - once you have seen it or let it pass beyond its current showings. Because it is a ghost story, and telling you that much changes how you see it. But I will tell you more. The Woman In Black is adapted from a novel by Susan Hill, written in the 80s in the style of the "Female Gothic" novel - You know Jane Eyre, Frankenstein, that sort of thing. Moors and castles and secrets. Yes, now you have more armor, more than when I went in. It was a rather meaty novel, so turning its strengths on the printed page into results on the stage would be a challenge. And they pull it off. Bradley Armacost is Arthur Kipps, who has hired an actor (known only as The Actor and played by Adam Wesley Brown). Kipps is a solicitor (ah, yes, it is a gothic, so England is its home) who seeks to exorcise a horrific experience in his life by sharing it with friends and family as a presentation. Kipps is a horrible neophyte to the theatre, to the point of reading the stage directions. The Actor sees the chance of making Kipps personal story something that could reach out and actually engage with others, and embraces him, challenges him, and takes over Kipp's part in his history. So we have The Actor playing the younger Kipps and Kipps playing all the other roles in the play within a play. Both actors are marvelous. Brown moves between being the theatrical life-coach for Kipps to Kipps himself, neatly and enthusiastically, while Armacost sells us at the get-go as a plodding dullard of a solicitor, who over the course transforms himself into all the people he met on the dogs-end of Britain. Both men sell their selves and we are comfortable with them. And comfort is a part of horror. I won't go into all the details of the plot - I've given you enough just telling you it is a ghost story. 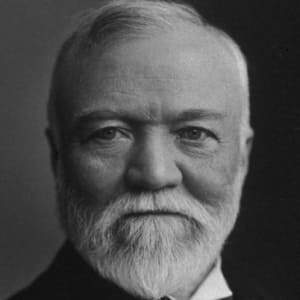 But I will say that stagecraft is wonderful as well. Starting with a bare stage and couple props, the story consumes and expands the world into the wilds of England, such that we are totally taken into the Actor's statement of the theatre selling reality, such that play-within-a-play may as well be the play and be reality. The walls break down, as it were. But I am interested in how to do horror on the stage. Adapter Mallatratt's presentation adopts novelist Hill's concept of the slow boil of horror, which in theatre has the challenge that the audience may not tolerate anything slow on the stage. Yet the play works as it slowly, slowly turns up the existential unease of book-turned-play-turned-personal-testament, and does so neatly. It starts from a place of comfort and familiarity and ends up breaking the man so you understand in part why Kipps is like he is. There are a lot of tools at work here. There are jump-scares. There is humor. There are characters and mysteries and things left unsaid and warnings and foreshadowing. There are remote locations and things that cannot be controlled. There are extremely clever things done with lights and sounds. There are sudden frights that leave the audience laughing, but they become uneasy laughs, such that the final revelations are sufficiently scary. The initiating incident of the play is in people telling ghost stories at Christmas (a British thing), but even telling people "I'm telling a ghost story" gives the audience clues about what to expect - spoilers as it was. Yet that is the way of talking about horror - we get insulated from it - it was a story about someone else, not anyone you know. It is an old book found in the library or some uncle's keepsakes that reveal a Lovecraftian horror beneath the sea or just someone telling a story. Blankets against the cold. But I have said too much. If you have the chance in the final week, go see it - indeed, one thing I noticed was that much of the crowd was younger, or at least less-grey, than my standard Sunday afternoon matinee. Ignore the posters in the lobby until the intermission (sorry, the interval) and the summary in the program book. So go see this play, but forget I said anything about ghosts. It's better that way. 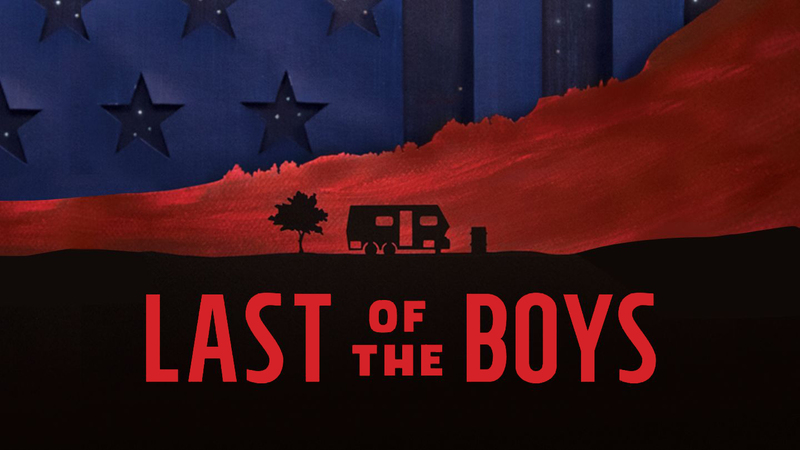 Last of the Boys by Steven Dietz, Directed by Braden Abraham, January 18-February 10, Seattle Repertory Theatre. Yeah, when you get distracted like that, the center is not really holding, and that's the problem of Last of the Boys. 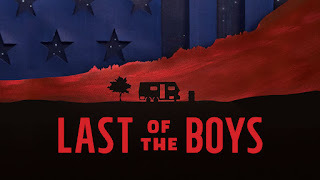 The play is getting portrayed in adverts on KING-Classic radio as being a play of male friendship, but it's really about 'Nam, and how as a national and personal event overwhelmed everyone in its path. Everyone in the cast is a casualty of the war. Ben (Reginald Andre Jackson) and Jeeter (Kevin Anderson) are vets, their friendship forged in the crucible of Southeast Asia, so that now, thirty-five years later (we figured), Jeeter stops in (from his life of teaching Sixties studies and following the Stones on tour) to visit Ben, who has a trailer on an old superfund site in Northern California. Their friendship is by turns relaxed and prickly, built on things that they cannot and will not talk about. This time Jeeter brings Salyer (Emily Chisholm) , his younger girlfriend (who lost her father to the war). Salyer is followed by her mom, Lorraine (Kate Wisniewski), who didn't even tell Salyer's father she was pregnant when he shipped out. And Ben is literally haunted by the spirit of the war itself (Josh Kenji), as Ben casts himself as Robert McNamara and gives press briefings standing at his ironing board to defend the war. And conversations occur. Secrets are revealed. There's a lot of chatter and grand statements. But it doesn't seem to go much of anywhere. There's no real rise of tension - just incidents and accidents. An intermission occurs, it seems, just because you can't go on for over two hours without one, not because there is any dramatic need. But the play seems to circle the central subject, much like conversations among men, but doesn't get as much to the meat of the situation. The actors are all fine. The set design captures the flavor of Northern California in the Central Valley. The Lovely Bride's sister and her husband live in Corning, and we've spent our time when visiting sitting on their broad porch overlooking the valley beneath (and watching for wild fires). But the play feels like it is being sold under false pretenses, and does not live up to its supposed goal. I just don't buy that Ben and Jeeeter are still friends after all these years, in particular when we finally understand Jeeter's connection to Ben's father.Are they friends simply out of habit? Out of the fact that there's nobody else left to share, but not talk about, their experiences? And here's the thing that bothered the Lovely Bride - Ben and Jeeter kept throwing their empties into a dumpster. California gives you a five cents rebate on your glass - you don't toss them. Yeah, and that's the problem - you get easily distracted because there isn't much to hold you to the center. And I spent some time figuring out where this was set, an hour and half outside Modesto. You go north, that's Sacramento, you go south, that's Fresno, West takes you into the Bay area, so maybe we're talking around Sonora? Again, this is stuff I should not be thinking about when the actors are still on the stage. As for 'Nam itself, I missed the bulk of it, and I am no young man anymore. The war was already well in progress when I first started paying attention, with older (male) cousins going into the services and talking about draft numbers. And by the time I had to worry about the draft, we were gone from there, with our helicopter taking off from the embassy (You know what worked better on the stage? Viet Gone. And I didn't mentally math-check that show). But for Viet Nam itself, I missed that particular horrific bonding moment, and Last of the Boys doesn't really fill in much of the blanks. Actually, this happened a while back, but I've been busy. Suffice to say that after a horrible, horrible December, the ship of industry righted itself and returned to is normal course. Which, in these besotted times, is various degrees of upwards. Right now it is hovering in the mid-24ks, with the occasional wide swing upwards or downwards which quickly is discounted as because of particular good or bad news - trying to fit the facts to the narrative. - The Federal Government shutting down for thirty-five days. This was an make-no-bones-about-it lockout. with people furloughed and those who were deemed invaluable forced to work without paychecks. Didn't seem to hurt the market. - The House has put some honest-to-goodness progressives on major committees that have the teeth to investigate the shenanigans in our economic sector. Yet that did not offend the markets. - The British Government failing to make good on its suicide pact to Brexit the rest of Europe, having not plan B, but leaving the same bunch in charge that failed to come up with first plan. This is globally huge, but didn't seem to hurt the market. - Ongoing trade war with China, which has cut off a number of its US Imports,, while we've chosen to make it more expensive to buy theirs. Not only hasn't hurt the market, but the fairy-whisper thin rumor that things may get better drives it upwards. - Continuing evidence and indictments on the Executive Branch which pretty much confirms the venal, illegal, and probably traitorous nature of an entire administration. Doesn't hurt the market, such that the dude is the White House tweets out that actually finding him guilty of his crimes WOULD hurt the market. Yet these things have not had much effect on the markets, which seem to indicate that they are even more disconnected from not only the national scene, but from the world itself. And this will last until they make another "correction", which the buzzword for a sudden plunge, at which point the wise heads will point some piece of economic minutia, like the Fed Chairman not ruling out a rate hike over a lunch date, as a reason for the sudden tailspin.